Bee Whyld is a small apiary specializing in producing Fireweed Honey located in Watson Lake Yukon. It is owned and operated by Courtney and Joel Wilkinson. Bee Whyld was officially founded in June of 2016, but it had been in the works for a few years before. Taking it right back to the beginning it all started in the spring of 2012 when Courtney took a job working for Chinook Honey Company in Alberta. Her mom already worked there and had suggested that Courtney work the markets on Saturdays selling honey as a second job. Courtney knew nothing about honey bees, or honey, but she thought it would be fun to spend Saturday mornings at a Farmer’s Market, so she went with it. She soon discovered that there was more to bees and honey than she originally thought. Customers would come up to her booth and ask what the difference between Multi Floral Honey, and Blueberry Honey was, or why they were different colors, etc. These questions not only lead her to want to know more about bees for her job, but they made her curious as well. She began asking questions, the people she worked for Art and Cherrie Andrews both longtime beekeepers were extremely helpful, answering all of her questions, and then some. Later that summer they invited Courtney to work in their store, and then to give lectures on Honey Bees. The lectures were a whole new learning curve. It’s one thing to answer a few questions on bees, it’s another to have to give a 45 minute talk about them. Courtney was constantly reading about bees, and learning more and more about them. By this point Courtney was hooked on Honey Bees, and gladly took the opportunity to go with her co-worker and take a level one beekeeping course. That following spring 2013 Courtney successfully captured her first swarm of bees, which lead to her and her mom doing a little swarm chasing together. Pretty soon they had their own hive of bees, and could officially call themselves beekeepers. That same summer Courtney flew to the Yukon for a few weeks to visit her then boyfriend Joel. Joel was born and raised in Watson Lake, and grew up living off the land. Driving from Whitehorse to Watson Lake is when Courtney first noticed the Fireweed Flowers growing along the road. 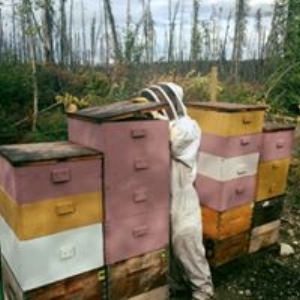 Knowing from her experience selling honey that Fireweed is not only one of the rarest honeys, it is also one of the best for flavor, and medicine, she began to wonder how hard it would be to bring her bees up to the Yukon and make Fireweed Honey. Joel knew of quite a few forest fires that were abundant with Fireweed, all they would have to do was figure out a way to keep the bees alive so far north. Bears, and the long cold Yukon winters were the biggest threats. Courtney and Joel got engaged in December of 2013, and Courtney moved to the Yukon that same month. She shipped her bees north in the spring of 2014, she had four hives at the time, keeping bees in the north was very different from Alberta. She had to throw out a lot of the stuff that she thought she knew, and learn through trial and error. Needless to say they didn’t get any honey the first year, in fact they lost two beehives over the summer, and then the last two in the early spring of 2015. Courtney was feeling discouraged, and almost gave up, but Joel had started to love the bees too, and he knew how much Courtney loved beekeeping, so he convinced her to try again. This time they ordered Bees through the mail from NewZealand. They ordered enough to start six hives. Using what they learned from the first year they managed to grow all six colonies through the summer, and even harvested a modest 200lbs of fireweed honey. They got married that summer as well. Our Bees Made The Winter We Were So Excited!!! Since then Bee Whyld has continued to grow. We now supply many stores across the Yukon with Fireweed honey. The long cold winters, bears, and ravens, have made beekeeping in the north a challenge, but a summer filled with happy humming honey bees makes it all worth it! Thanks so much for reading our story we are looking forward to another great season here at Bee Whyld, and we hope you love our honey as much as we do! Also please follow us on Facebook for recent updates on our bees!